Zootropolis (AKA Zootopia) is not, in many respects, a remarkable release from Disney. Their latest animation once more features anthropomorphic animals extolling wholesome values of self-acceptance and tolerance whilst flat popular culture references "for adults" are scattered throughout. Added to these issues is the jarring addition of Shakira within the cast as an inconsequential, shoe-horned character. Everything, at this point, sounds rather too much like 2004's woeful Shark Tale. However, despite the film's handful of flaws, it must be remarked that Zootropolis is actually something of a brilliant movie - perhaps the best mainstream animated multiplex-release since Big Hero 6 charmed each of us with its winning mix of whimsy and discovery. Like all great films this is a feature which leaves us both dazzled and enriched. The tale focuses on Judy Hopps (Ginnifer Goodwin), an inhabitant of Bunnyburrow, eager to become the first ever rabbit police officer of the neighbouring Zootopia. Her enthusiasm is met squarely with opposition from all around her - Hopps' grades mean nothing to those who thinks she should learn her place in society and give up on her aspirations. Anti-rabbit sentiment is thoroughly, and institutionally, ingrained too at the force where she finally earns a position. The big cases are left to larger animals whilst the more demeaning parking duty beat is assigned to our spirited new-comer. Yet, indefatigably, Hopps excels in this role too (despite her naive belief in the inherent goodness of the people she meets). 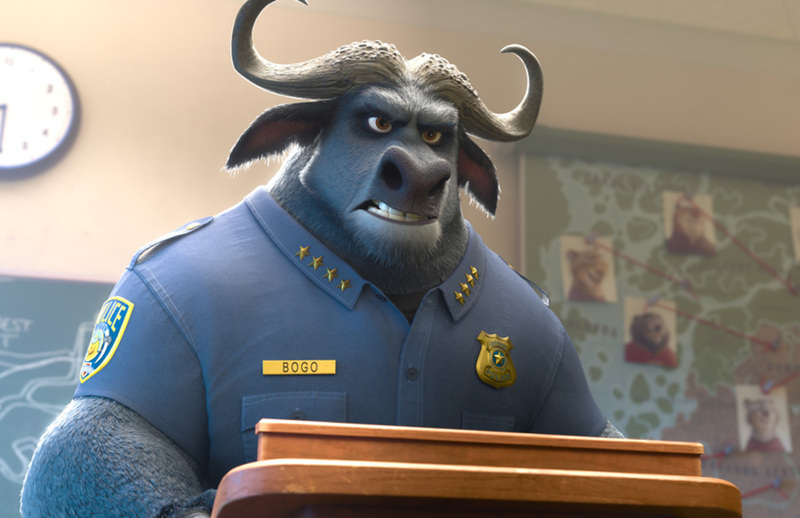 Dreams of more exciting tasks are put on hold until, one day, she finds herself caught in the middle of a missing animals case - her boss, Bogo (Idris Elba), reluctantly lets her pursue the issue but with the caveat that, if the case is not solved in 48 hours, Hopps must resign. 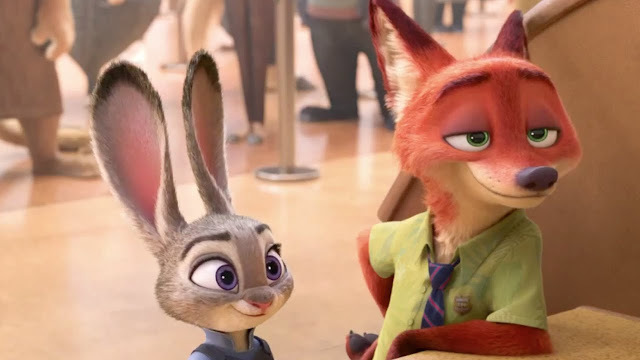 Using her smarts, and the know-how of Nick (Jason Bateman) - a small-time crook she must collude with - Hopps sets about uncovering the mystery of Zootopia's disappearing citizens whilst, simultaneously, challenging the societal orthodoxies of her world. The joy of Byron Howard and Rich Moore's movie comes with its level-headed, albeit thorough, investigation into identity politics in a manner seldom found in cinema. This is a movie which shows us that we are each different and, indeed, these differences should be acknowledged and celebrated. Similarly too, however, Zootropolis also confronts us with the folly of pigeon-holing people based on our assumptions - talk of prey versus predator and the natural savagery found in certain species highlights bigotry and prejudice, drawing clear parallels with the world we live in. When discussions of protecting the "majority" from the assumed dangers presented by "minorities" - in this case, quite literally wild animals - are presented to us, we shudder at the symmetry these statements have with the right-wing rhetoric we're currently subjected to in mainstream politics. Anyone who has heard Donald Trump or Nigel Farage speak on immigrants will be certain to recognise the venomous hatred found here. Cleverly, we find that not even our hero is immune to occasional, unthinking, hatespeak - this is a movie which shows that any one of us, if we don't pause to consider our positions, can end on the wrong side of intolerance and wickedness. Whilst this may be a movie of animated, anthropomorphic beasts, it is also one of the most human, and humane, films of the year so far.